In our quest to find the right process for selecting a learning technology company, we realized that the social popularity and acceptance of a company is a critical factor. 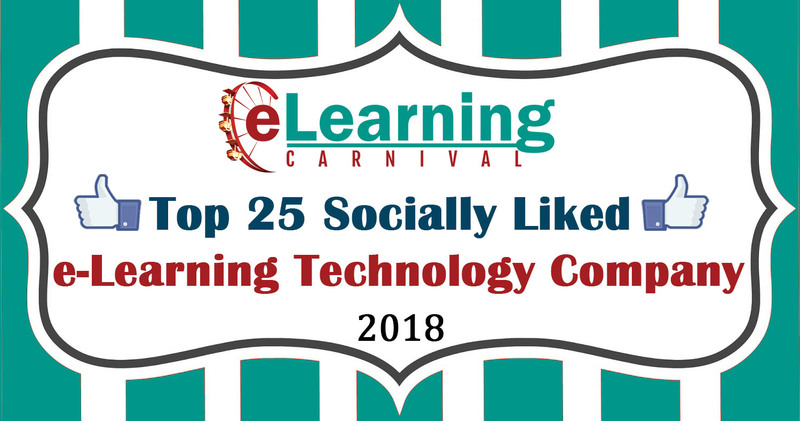 So we decided to find out the Top 25 Socially Liked e-Learning Technology Companies, which we can recommend to our readers and clients. How did we find out these companies? So we started our research on 130 leading e-Learning technology companies which have appeared in the famous “Top” lists. We looked at the four major social media platforms – Facebook, Twitter, Linkedin, and YouTube, because these were the standard platforms used by almost every company. Note: We have created this list based on our internal objective research. We did not seek applications or justifications from any company mentioned here. We did not seek any “Financial Sponsorship” or “Application Fee” for the award. We counted the number of followers, number of likes, number of reviews, the activity on the social media platforms. The duration of our research was 9th Feb 2018 to 16th Feb 2018. We created a weighting mechanism to do calculations. Finally, we also took into account the number of employees and normalized the score by adjusting the internal likes. We tried to be completely objective in our selection process. No subjective decisions were allowed to creep into the process. Why Should you Consider this List? Whether you plan to buy a service or seek employment with a company, the Social Factor plays a significant role. The companies that appear in this list tend to be socially active and transparent in their operations. They open their organization for a conversation on the public platform, accept their mistakes publically and take corrective action if needed. They seek feedback from the employees and customers and resolve the complaints as soon as possible. We intend to publish this list annually. We will update the list in March 2019.
iSpring, MindTickle, Kineo, Training Folks, ExpertusOne, CommLab, Cypher Learning, Instructure – Bridge, Allen Interaction, The Training Associates, Tata Interactive, EIDesign, Biz Library , Totara, NetDimensions, ej4 , Shift E-Learing, AchieveForum, LeoLearning, The Cara Group Inc, Pulse Elearning, SpongeUK, WagonsLearning, Fuse Uniersal, Virtual College, CoreAxis, Pathgather, SweetRush, E-Nyota Learning, Eleap, BrightWave, Hurix, LearnDash, Magic Software, Xyleme, Aptara, Torch LMS, AllenComm, Arcusys, Intrepid, Pryor Learning Solutions, InfoPro, Easygenerator , NIIT MTS, Growth Engineering , LearningMate, B Online Learning, Kallidus, Digital, Chalk, Qstream, LearnUpon, Learnnovators, Paradiso Systems, Enspire, Create LMS, Unboxed Technlogies, SkillJar, Meridian Global , eLogic Learning , Wisetail, Obsidian Learning, CineCraft, Absorb LMS, Dashe & Thomson, Caveo Learning, CLD Inc, Gyrus Systems, Prosperity, Accord LMS, GLAD Solutions, ELEARNINGFORCE , Tipping Point Media, Ardent Learning, Digits, Swiss VBS, eWyse, Zoomi, ShezarTech, Agylia, Brainier, Roundtable Learning, Dvinci Interactive, Eurekos, Rephraserz, Harbinger, Cue Labs, Blackboard , GetRapl, LearnAmp, Actio Learning, Posiview Tech, Lippincott Gurukul, IMC Learning Suite , Instructure Canvas, Edukey, Edmodo, Instructure – Canvas, Kenexa Learning, Sakai, CoursePlay, Delphianlogic, Edubrite, Intellezy.